Speaking of grey, this past weekend was cool and cloudy (and now it's...*shock/wonder/amazement*...raining! ), so on Sunday, Matt and I headed over to the Sunset Junction Intelligentsia to get an extra good cup of hot coffee and replenish our supply for the work week. We picked up two bags of their Celebration blend which has delicious notes of toasted hazelnuts and hints of baking spice—perfect for ringing in the season, and chilled out on their Tolix chairs for a bit. 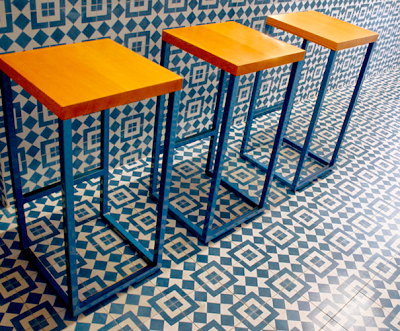 The coffee's good, but who cares when you've got tiles like that!? Every time we go over there I just stare at the floor. You can get the exact tile Barbara Bestor (who also designed the A+R interior) used right here. And the celebration blend ($18 per pound) is available online if you're not a Chicago, New York or Los Angeles resident.